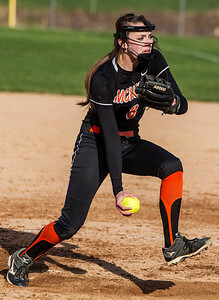 Kyle Grillot - kgrillot@shawmedia.com McHenry junior Kristin Koepke pitches the ball during the second inning of the girls softball game Monday in Cary. McHenry beat Cary-Grove, 5-3. Kyle Grillot - kgrillot@shawmedia.com McHenry team including Maggie Wiegman (from left), Dana Walsh, Rachel Ford, Katelyn Sena, and Ashley Clingingsmith before the sixth inning of the girls softball game Monday in Cary. 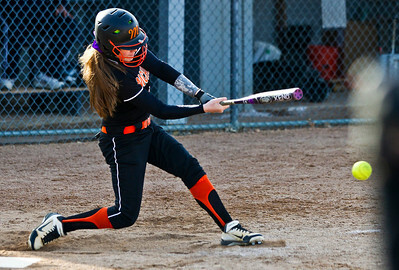 McHenry beat Cary-Grove, 5-3. Kyle Grillot - kgrillot@shawmedia.com Cary-Grove junior Amanda Degroote (right) attempts to tag McHenry sophomore Alex Martens as she slides safely home during the fourth inning of the girls softball game Monday in Cary. McHenry beat Cary-Grove, 5-3. 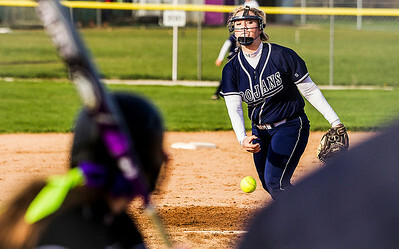 Kyle Grillot - kgrillot@shawmedia.com Cary-Grove junior Amanda Degroote pitches the ball during the fifth inning of the girls softball game Monday in Cary. McHenry beat Cary-Grove, 5-3. Kyle Grillot - kgrillot@shawmedia.com Cary-Grove sophomore Brianne Prank (right) drops the ball as McHenry junior Dana Walsh slides safely back to first base during the third inning of the girls softball game Monday in Cary. McHenry beat Cary-Grove, 5-3. 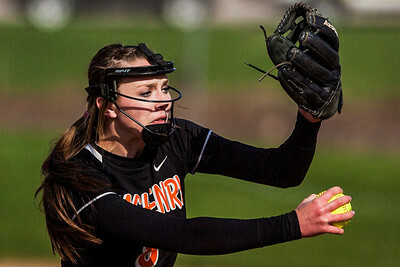 Kyle Grillot - kgrillot@shawmedia.com McHenry junior Kristin Koepke pitches the ball during the fourth inning of the girls softball game Monday in Cary. McHenry beat Cary-Grove, 5-3. 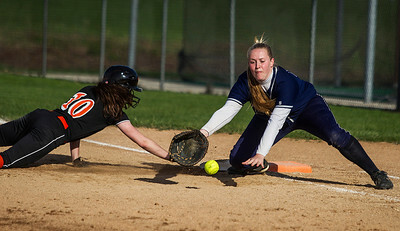 Kyle Grillot - kgrillot@shawmedia.com Cary-Grove junior Kaitlyn Adams (left) tags McHenry junior Hannah Crowley out at third base during the second inning of the girls softball game Monday in Cary. McHenry beat Cary-Grove, 5-3. 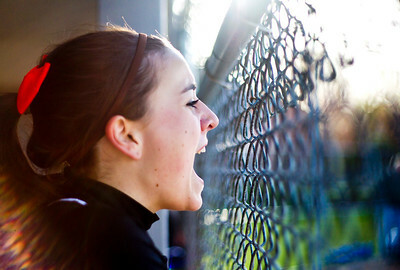 Kyle Grillot - kgriillot@shawmedia.com McHenry senior Ashley Clingingsmith cheers on her teammates during the sixth inning of the girls softball game Monday in Cary. McHenry beat Cary-Grove, 5-3. 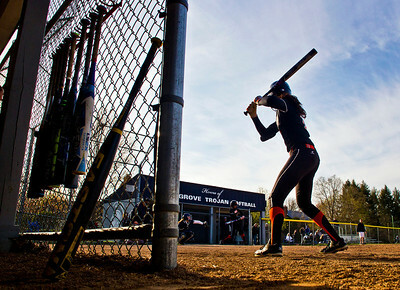 Kyle Grillot - kgriillot@shawmedia.com McHenry junior Carly Mattson warms up before batting during the sixth inning of the girls softball game Monday in Cary. McHenry beat Cary-Grove, 5-3. 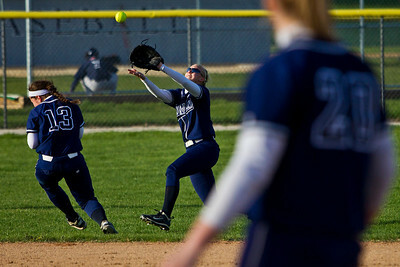 Kyle Grillot - kgriillot@shawmedia.com Cary-Grove senior Jamie Deering, (left) dives out of the way of as Lisa Semro makes a catch during the second inning of the girls softball game Monday in Cary. McHenry beat Cary-Grove, 5-3. Kyle Grillot - kgriillot@shawmedia.com McHenry junior Carly Mattson catches a pitch from junior Kristin Koepke during the fifth inning of the girls softball game Monday in Cary. McHenry beat Cary-Grove, 5-3. 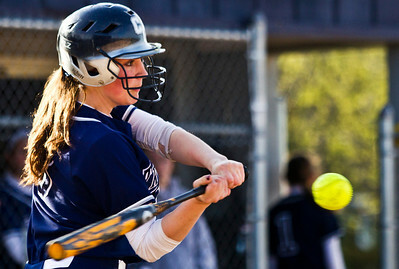 Kyle Grillot - kgriillot@shawmedia.com Cary-GroveCary-Grove junior Grace Pilz swings for a pitch from McHenry junior Kristin Koepke during the fifth inning of the girls softball game Monday in Cary. McHenry beat Cary-Grove, 5-3. 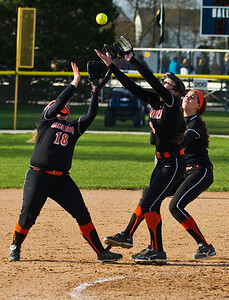 Kyle Grillot - kgriillot@shawmedia.com McHenry's Megan O'Donnell (from left), Kristin Koepke, and Alex Martens go to catch a fly ball during the fifth inning of the girls softball game Monday in Cary. McHenry beat Cary-Grove, 5-3. 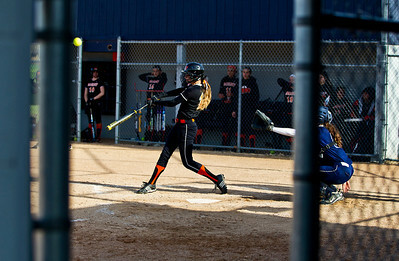 Kyle Grillot - kgriillot@shawmedia.com McHenry junior Carly Mattson hits a pitch from Cary-Grove junior Amanda Degroote during the fourth inning of the girls softball game Monday in Cary. McHenry beat Cary-Grove, 5-3. 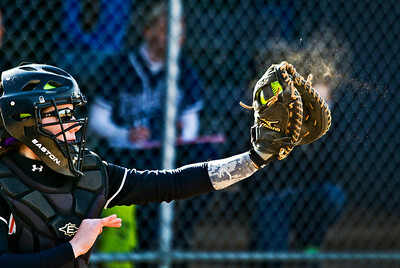 Kyle Grillot - kgriillot@shawmedia.com McHenry senior Katelyn Sena hits a pitch from Cary-Grove junior Amanda Degroote during the second inning of the girls softball game Monday in Cary. McHenry beat Cary-Grove, 5-3. 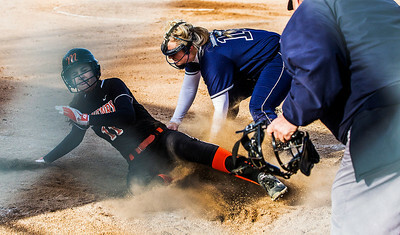 Kyle Grillot - kgriillot@shawmedia.com McHenry senior Megan ODonnell attempts to tag Cary-Grove senior Jamie Deering as she slides safely to third base during the second inning of the girls softball game Monday in Cary. McHenry beat Cary-Grove, 5-3. 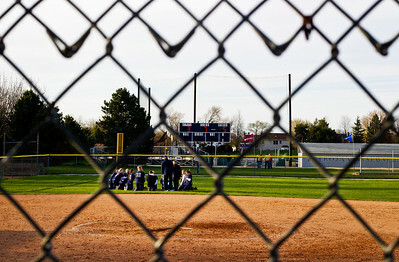 Kyle Grillot - kgriillot@shawmedia.com The Cary-Grove gathers in the outfield after the girls softball game against McHenry Monday in Cary. McHenry beat Cary-Grove, 5-3. McHenry senior Ashley Clingingsmith cheers on her teammates during the sixth inning of the girls softball game Monday in Cary. 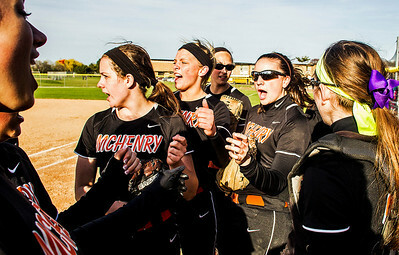 McHenry beat Cary-Grove, 5-3.